First I wanted to share this great picture of Ben exiting the ride fairly early on in the evening (it's still light out, so it has to be from somewhere in the first few hours). "That was fun. Maybe I should do it again." 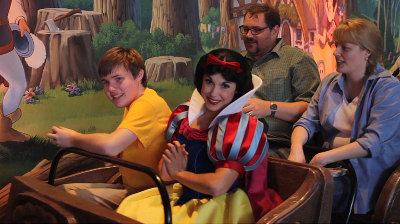 The next one is the best picture I have seen with Ben actually in the mine cart with Snow White. Again, please go visit Robert's blog post to see the full sized image. 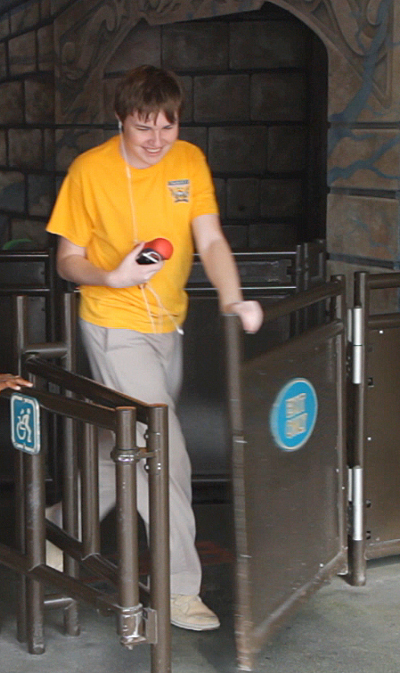 Finally, here is a a 6 1/2 minute video of Ben meeting Snow White, going on the ride with her, and then visiting with her some more after the finish. I have to say, I was there for this whole thing. You can see me in the video. When I watched this clip I knew exactly what was coming, and I still teared up. When Ben blows her a kiss near the end, it just about breaks my heart. A huge thank you to my friend Robert for capturing these moments for us. It was such a relief to be able to just focus on Ben for that entire evening and know that Robert was there capturing it all. Now if you'll pardon me I need to go find some Kleenex, I seem to have something in my eyes again.